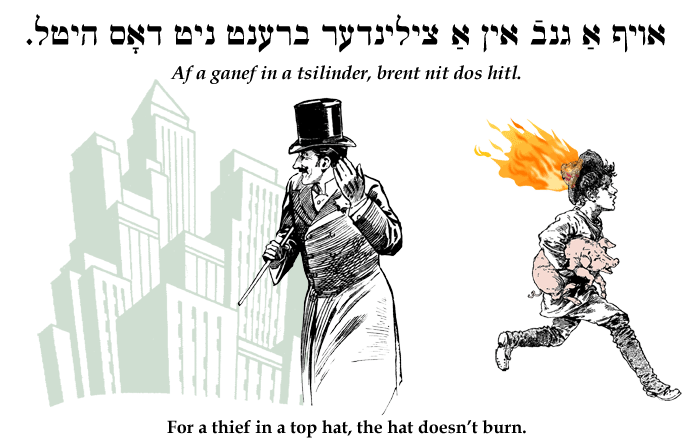 Yiddish Wit: For a thief in a top hat, the hat doesn't burn. אויף אַ גנבֿ אין אַ צילינדער ברענט ניט דאָס היטל. Af a ganef in a tsilinder, brent nit dos hitl. For a thief in a top hat, the hat doesn't burn. A cynical reference to the well known saying on the previous page. Unlike a common thief, the wealthy robber baron is not recognized as a criminal. SOURCE: Stutchkoff, Der Oytser fun der Yidisher Shprakh. The word צילינדער (tsilinder, literally "cylinder") refers to a top hat.